PokerStars is – without doubt - the number one poker room on the internet in terms of popularity, with well over 50 million registered users. It was PokerStars who were responsible for the explosion in internet poker after an entrant to one of their World Series of Poker (WSOP) satellite events - the appropriately-named Chris Moneymaker – went on to win the 2003 Main WSOP Event. 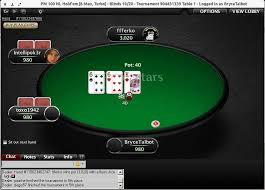 PokerStars are owned by The Rational Group, who also own Full Tilt Poker. The first step in becoming a PokerStars poker player is to download the dedicated poker room client. Just head to the PokerStars site and click on the Download link. There are versions of the PokerStars poker client for Windows, Mac, iOS and Android. The client software weighs in at 32MB so shouldn't take too long to download, depending on the speed of your internet connection. Once downloaded, just click on the .exe file to install. The great news for Linux users is that the PokerStars poker app works fine under Wine. Once you have installed the software, run it and you will be presented with the game lobby. To create an account, click the “Log in” button then “Create New Account...” on the Log In pop-up. 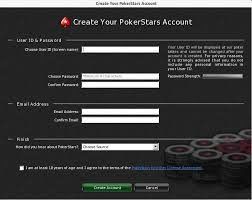 To create an account at PokerStars poker you just need to fill in your chosen User ID and password, an email address, and check the T&Cs box. That's it! You'll receive a note to welcome you to PokerStars poker with an option to make a deposit, or play with the 1,000 Play Money chips you've just been granted. You'll be presented with a 100 percent first deposit bonus at PokerStars poker that's worth up to an incredible $600 (or whatever that is in the equivalent currency of your choice). You can spread your deposits over three separate payments up to a maximum of $600 within the first 60 days of your account being opened – you just use the STARS600 bonus code each time. Once your have completed your deposit(s), you have 120 days in which to clear as much of the bonus as you can. The bonus is released in $10 increments for every 200 VIP Player Points (VPPs) that you earn, and you earn VPP points at a rate of 5.5 VPPs for each $1 spent at the casino. I downloaded the poker client and managed to get it up and running instantly, and was suitably impressed. Logging in was a breeze, and I was greeted by a simple “My News” screen that informed me about the latest poker tournaments at PokerStars. This was about as obtrusive as the client got. All the cash tables were displayed, with the default settings as No Limit Texas Hold'em Poker, and find tables in other games and in other limits only took a single click, and you could filter out the stakes you weren't interested in, and change the view to suit. If you couldn't be bothered to search through all the options there was always the “Seat Me Now” option where you'd automatically be seated at a table. I tried to sit down but was told I needed to confirm my email address, which I did so via the confirmation email I had been sent. Heads-up through to Multi-tables. Buy ins: 1 FPP* to $5,000. I decided to try my hand at a freeroll for Play Money before trying anything else on the site. I found the next Play Money freeroll tournament within a couple of clicks, and tried to register, but it was for 5,000 Play Money chips, and I had only been given 1,000. A dialogue popped up offering me the chance to buy Play Money Chips! I could buy 165M chips for $199.9!! I declined, although 350,000 Play Money Chips was only $1.99. I found a freeroll tournament for a 1,000 chip buy-in but that was for an 8-game tourney and my Stud poker is a little rusty. If there is one criticism of PokerStars, it's that there's too much choice! Finally I found a No Limit Hold'em SnG for 100 PlayMoney Chips on a nine seat table, which I clicked on, then register when I reached the game lobby. The table filled up really quickly and I was off! I really liked the table interface, especially the smooth animations. I did not have to configure the table at all - it was fine the way it was. Players from the United States are allowed at PokerStars but they can only play on the play money tables. Players from France, Italy, Estonia, Belgium, Denmark and Spain also have some restrictions. PokerStars holds plenty of promotions, especially in tandem with the major live poker events it hosts. As an alternative to the welcome bonus you can use the FREE20 code and receive $20 worth of freeplay cash if your first deposit is more than $20, and you'll also gain an entry into the 100k Privilege Freerolls, where you can play for your share of $100,000. PokerStars boasts that its VIP club is the most lucrative in poker. There are seven levels to rise through when you're a member of the PokerStars VIP club, from Bronze to Supernova Elite, and the further you progress the better the rewards! Make it all the way and you receive a free $5,200 WCOOP ticket. PokerStars has mobile poker clients for iPhone, iPad, iPod touch and Android devices. All the most common questions regarding PokerStars poker can be found in the site's extensive list of FAQs and other options in the “Help” section of the poker client. 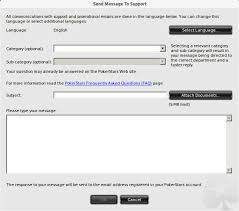 If you have a question that is not answered, you can send a message by a contact screen, but currently PokerStars has no 24/7 instant chat feature. ✔ - A great list of available poker variants – it's not just Texas Hold'em poker! Someone has to sit on top of the online poker tree, and all evidence points to that position being held by PokerStars. The poker client itself is one of the best I have seen – it's responsive and intuitive and once you get used to where all the buttons are and what they do, then its very easy to find exactly what you want, although sometimes you do have to wade through a lot of stuff that doesn't interest you first. Unlike other clients the PokerStars poker client is extremely functional and you are not bombarded by adverts and other pop-ups pressuring you to deposit $$$s as soon as you sign in. The table display itself is really nice, and I particularly liked the smooth animations as the cards and chips slid across the table. There's brilliant support in multiple languages, an excellent array of playing options and several ways of getting your cash in and out of your account. If you're keen to start your career in online poker, than I can heartily recommended signing up to become a member of the PokerStars poker family!